Just in time for the holiday season SAS® has added Pewter to the colors available in their newest little loafer Metro. Metro comes complete with all of SAS's quality features including SAS Tripad Cushions, Comfort Footbed, True Moccasin Construction, and Supersoft Lightweight Soles. Add to that their Contoured Arch Cushions, Pillowsoft Linings, Cushioned Tops and their Supportive Heel Counters and you have a shoe that gives you all day comfort. This little shoe has a jewelry like decorative embellishment over the instep that helps give it that dressier look in a low heel shoe. Metro is available in Slims, Narrows, Mediums, Wides and Wide Wide widths. The available colors are Black Crinkle Patent, Wine Crinkle Patent, Bone Crinkle Patent and the New Pewter Leather. Please stop by and see this style and try it on. Also remember, SAS Shoes make good gifts. You're loved ones will thank you. Brrr - BABY IT'S COLD OUTSIDE. The temperatures have dropped and my feet are chilly. I guess it's time to clean and put my sandals away until next spring. OH, that means I can get some new Fall/Winter shoes, but which styles do I choose from? I will need an everyday shoe - and I think I will get FREETIME (our number one selling shoe). It comes in White, Black, Bone, Mocha, Navy, Teak and Nubuck Charcoal. I think I will be getting the Nubuck Charcoal. I will need an alternative everyday shoe and I think I will get SAS's new ACTIVE COMFORT Shoe TOUR. It comes in All Over Leather with Light Blue Trim and a Leather/Mesh Combo in White with silver trim. I like the Leather/Mesh Combo, but think for winter I will get the All Over Leather. I already have EASIER (with a little wedge heel) in Black to wear when I need to be a little more dressed up. I also have the cute little loafer SIMPLIFY in Black Crocodile. I better not forget I have my WEAVE loafer with a higher wedge sole that I have in Chestnut. I'm thinking that I will need something a little dressier, and that means that I want a pair of the TABBY Sandal in Black with Black Snake Accents. It may be cold but I simply must have these. That puts me at 6 pairs of shoes for this Fall/Winter Season. Three I already have in my closet and three I will have to add. It's not easy to pick those 6 pairs either because there are lots of styles and colors I would like to also. Like most women I will add a few each season. I really, really want a pair of the new ROAMER in Chestnut and TRAVELER in Dark Brown. I would also like to have STRIPPY in Black, God and Pewter, and don't want to forget SIMPLIFY in Red and Brown Crocodile or TWIN in Brandy. At this point I think it is easy for you to see that I love shoes. More importantly, I love SAS® Shoes. SAS® continues to bring us new, younger styles while still maintaining the support and comfort that they are famous for. Come and visit our store in Nashville, TN and glimpse at all the styles and colors to choose from Your feet will love you. Most people don't think of SAS® Shoes as pretty or fancy, but they would be wrong. While SAS® still does not have a Dress Pump in their line yet, they do have some beautiful dress sandals. They also have two simple little loafers that can be dressed up or dressed down. For the holidays I would like to suggest some SAS® Styles and the Holiday Colors they are available in. METRO - A crinkle patent leather loafer which is available in Black. SIMPLIFY - A plain and simple loafer which is available in Copper, Red, Black and Black Croc. STRIPPY - A strappy sandal that is available in Black, Gold and Pewter. SUNTIMER - A T-Strap sandal that is available in Copper, Red, Black and Black Croc. TABBY - SAS's newest dress sandal which is available in Black with Black Snake Accents. 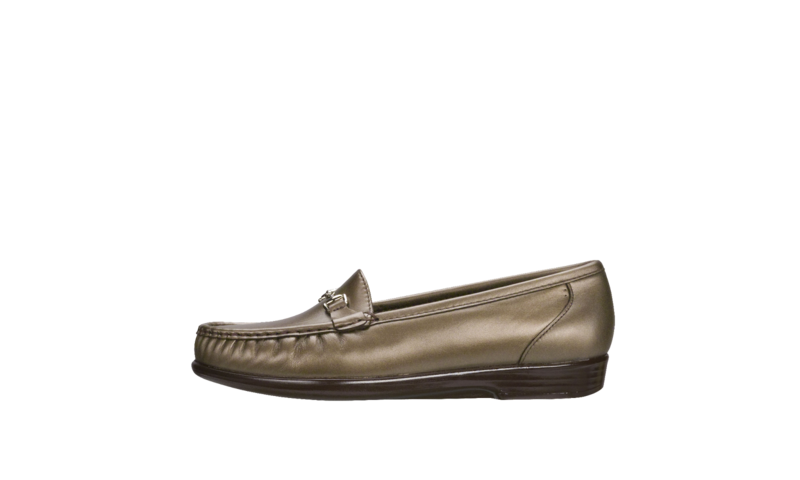 Lets not forget that SAS® has a wonderfully comfortable Mens Dress Loafer too. ACE - which is available in Black. If you've have Holiday Parties to go to or just want some pretty fancy comfortable footwear you need to see these styles. Come and see us in Nashville, TN to look at these styles.